Those of us who are old enough to remember vinyl records will recall how a scratch can cause the same sounds to repeat many times. A similar type of genetic glitch causes neurodegenerative diseases such as Huntingtonâ€™s and several forms of spinocerebellar ataxia. Huntingtonâ€™s and the spinocerebellar ataxias are known as â€œpolyglutamineâ€ diseases. In each, the affected gene has a stretch where the same three DNA letters are repeated several times — more than usual. As a result, the protein encoded by the affected gene has a patch, where only the building block glutamine can be found, disrupting that proteinâ€™s usual functions in the body. 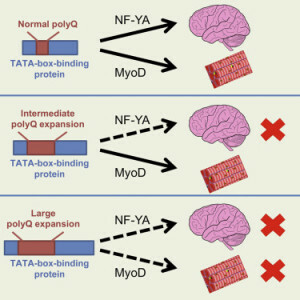 Geneticist Xiao-Jiang Li and colleagues recently published a paper in Cell Reports that may explain why more aggressive juvenile-onset forms of polyglutamine diseases have different symptoms and pathology. Liâ€™s findings, in a mouse model of spinocerebellar ataxia 17 (SCA17), are most applicable to SCA17, which is very rare in humans, but may also explain aspects of Huntingtonâ€™s and other spinocerebellar ataxias. They observe that larger polyglutamine repeats selectively poison muscle tissue, in addition to the nervous system (see figure). SCA17 affects the gene encoding TBP, a protein important for the vital process of transcription. 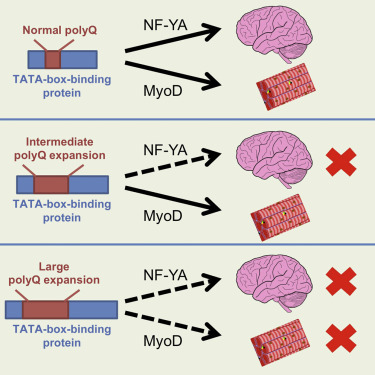 Polyglutamine patches appear to interfere with TBPâ€™s interaction with MyoD, a muscle-specific transcription factor. Figure from Cell Reports (open access/Creative Commons).